Enhancing a Sky, Shortcut Key— "M"
These instructions are assuming that you have already made Basic corrections, either Raw or JPG, to your photograph, have set a Tone Curve and have chosen a Camera Calibration (Raw only). LR has several tools to help you enhance a sky in your photograph. However, if you have a sky with parts of it that do not register color, i.e., blown out, nothing you do can get that color back. In that case, toss that photo and find another one that will work out better. It’s a hard lesson to learn but a lesson that will make you a better photographer: be sure you meter for the brightest part of your photograph, especially if you are shooting for the sky. You can use the Adjustment Brush tool to individually enhance specific parts of the sky as needed, using the same levers that you would use in the Graduated filter tool. This would be a good approach when the photograph has only a small section of the sky that you want to work with, not the entire skyline. But in this article I am focusing on how to improve the entire sky with the Graduated Filter tool and the HSL/Color/B&W panel. Follow the guidelines below and see how the process works for you, remember your original photo is never changed. In the Basic panel, make sure you have pushed the Highlights lever down, or left, to darken the sky. Make any other processing adjustments you still need to make to the entire image. 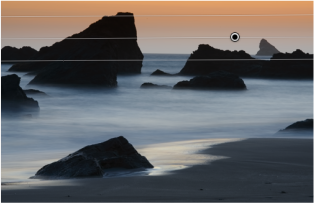 From the Develop module click on the Graduated Filter tool (the rectangular icon between the “eye” and the circle) at the top of the right panel, located in the Tool strip, to open it, or use the shortcut key “M” to open the Graduated Filter tool chest. Double click on the Effect button (on the left side of the panel) in order to set everything to zero (in case some of the levers are not at zero) so that you can be assured you are starting from the zero point on all levers. Click and drag within your photo and three lines appear: click an outer line and a hand appears and you can drag down or up on that line. If you have not used this tool before, it covers a wide area of space and allows you to make multiple corrections to a large expanse of your photograph all at once. You can create multiple graduated filters and can create a graduated filter from the bottom up, either side, or the top, depending on your photograph and what corrections it needs (click on the New button each time you want a new graduated filter: it is at the top right side of the panel). If you click, hold and drag the line down while holding the Shift key it will keep the lines straight on the photograph, depending upon the direction you are dragging. (See graduated filter lines, photo left). You will notice that there is now a darkened button or pin on the middle line: this button, when darkened, means it is selected. You can move this button across the lines to set a point from which the changes will originate. You can widen or decrease the lines as needed to meet your needs (the bottom or top line) by clicking and dragging on one of the outer lines. To tilt the lines vertically select the middle line and you will see a rotation icon that will allow you to move the lines completely around in a circular pattern. You can use the Highlights lever moved toward the left to darken the lighter parts of the sky. Move the Saturation lever back and forth to see if it does anything you like, normally you would want to add a little saturation so move it to the right to do this. Each photograph is different and may require different approaches. You can warm up or cool down your sky with the Temp lever or even make a slight color correction with the Tint lever. You can change the sky color using the color tool; click on the color box and a list of colors will come up, pick one and your sky color changes (if you only see gray or black click on the tiny box at the bottom right and an eyedropper appears, pull it upward to get colors). In general do not use the Clarity, Sharpness or Contrast levers: these are usually not good corrections for enhancing your sky. Now, while you still have the photo in the view window, hit the “F” button on your computer. 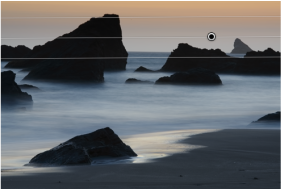 The photo will enlarge to the size of your screen so that you can actually see what you’ve done (make sure the photo is in “fit” mode in the Navigation panel). Hit “F” again and it will revert to its original size. Still in the same screen hit “Y” (only in the Develop module) and you can compare the corrected photo to the original photo. Hit “Y” again and you return to the original screen. If you are happy with these corrections close the Graduated Filter panel by clicking on it or hitting the “M” shortcut key. Remember, you can always go back and make changes later. Still in Develop module Click the HSL panel to open it. In this panel you can change the Hue, Saturation, and Luminance of your sky. Corrections made apply to the entire photograph so apply with care. The correction that works best for this is making a minus Luminance correction in the sky colors, usually blue, red, yellow or orange. Play with these levers until the correction suits you. You can over-do this so be careful. The little tiny button with the arrows up and down to the left of the words Hue, Saturation and Luminance, allows you, once you click on it, to click in the photo on a color and change the color by dragging the icon up or down until you are happy with your correction. It’s also very handy for finding out what the colors actually are as colors can sometimes fool you when you are trying to make the corrections manually. Again, at this point, you might want to check the photo at a larger size by clicking on the “F” key or check what the original image looked like using the “Y” key. You can also use the Saturation and Hue levers in the same manner. In Detail, when you add sharpening to the entire photo, you can use Masking to prevent the sky from being sharpened (and making it appear to have more grain) by clicking on Masking and holding down Option/Alt at the same time. The sharpen levers in LR are automatically set at Amount 25, Radius 1.0, Detail 25 as a standard upon import. When you click on the Option/Alt key the entire photo will be mostly white (everything is being sharpened). As you drag the lever to the right the photo shows more black and the white lines become sharper. The black portions and lines are not sharpened and the white portions and lines are sharpened; you can move the lever around to find the point that works for you, I usually stop somewhere before or around 10. I hope this information helps you understand how to improve a sky in a photograph using Lightroom. Something else that will help you is a book by Michael Frye, "Master Lightroom!," Landscapes in Lightroom 5. Michael is a master landscape photographer and editor who uses Lightroom to bring out his vision of the photographs he takes.